The realist Irish artist Patrick Leonard was born in County Dublin. He studied fine art painting and figure drawing under Sean Keating and Maurice MacGonigal at the Metropolitan School of Art, Dublin (now the National College of Art & Design). 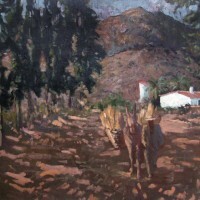 He started exhibiting at the Royal Hibernian Academy (RHA) in 1941. Such was Leonard’s talent that the academy offered him associate membership just a year later, ultimately he went on to become an honorary member of the academy. In 1952 he represented Ireland at the Olympic Games exhibition at Helsinki. From 1953 to 1982, Leonard was a full time art teacher in Dublin. Sadly, bouts of illness often interrupted his work as both an artist and teacher. Although he would stop painting during these periods, he always continued sketching and drawing. Indeed, for much of his early life Leonard sketched everywhere he went, every minute of the day. He made drawings on the train, waiting for a bus, while adjudicating exams – everywhere. These sketches were later worked into finished oil paintings and became an important part of his painting method. 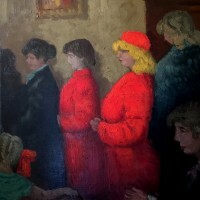 Patrick Leonard’s realist genre-painting featured the small scenes of everyday life- street traders, people waiting at a bus stop, bathers on a beach and so on. However, between 1957 and 1980 Leonard ceased to paint almost entirely. When he resumed, he had a one-man exhibition at the Oriel Gallery in Dublin, in 1979 and later a substantial retrospective in 1990 at the Gorry Gallery. A recent perspective on Leonard’s art was offered in a retrospective at James Adam & Sons in 2006. 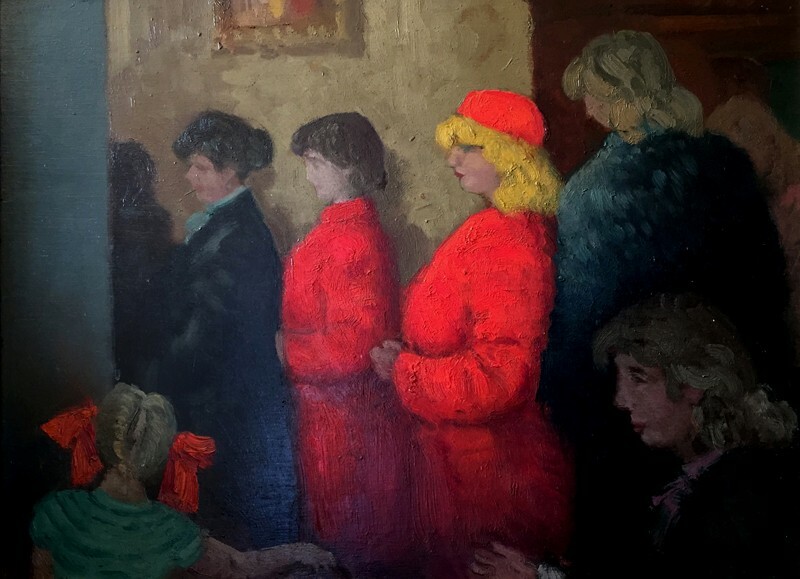 Patrick Leonard’s artwork appears in several public and private collections of Irish art. One of his self-portraits hangs in the National Self-Portrait Collection of Ireland at the University of Limerick. These days his paintings sell for healthy prices – his oil painting “On the beach, Rush” sold at Christie’s in 2001 for £17,625.